One of our stops Saturday was the Holly Union Depot. 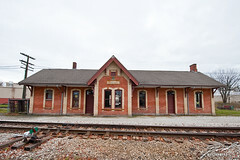 Built in 1886, this depot served two separate railroads - the Detroit & Milwaukee (now Canadian National) and the Flint & Holly Railroad (now CSX Transportation). It is currently being restored but I was unable to find much about that effort on the web.